Some of the best shows are the ones put on by Mother Nature, such as the recent total solar eclipse. Another spectacular show, available in much of the U.S., is the dramatic change in the color of the leaves, starting in late September and extending well into November. Regardless of where you are in the country, there is probably a scenic drive not far away. But just like the eclipse, timing is everything because the leaves burst into bright color at different times, and those times can vary year to year. When you think of leaf-watching, you probably think first of New England, long regarded as offering some of the world's most spectacular foliage. You can attribute that to its northern climate and abundance of sugar maple trees. The leaves on these trees turn from green to brilliant oranges and reds. This video, shot from a drone last fall, provides a glimpse of what fall is like in New England. Northern Maine starts to turn in late September, with Vermont, New Hampshire, Massachusetts, upstate New York, and Pennsylvania joining in by mid-October. From a base in Boston, you can set out and see the changing leaves from several different vantage points. The drive departing from central Massachusetts takes you through thick, mature trees and past historic villages that celebrate the season with festivals. 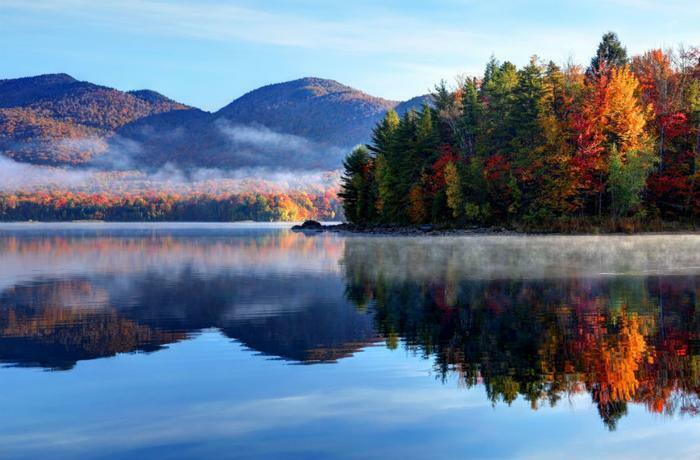 Heading north, you can crisscross the Connecticut River between Vermont and New Hampshire, both with plenty to offer leaf-peepers. In New Hampshire, scenic Route 3 takes you to Franconia Notch State Park. There, you can leave your car and board the Cannon Aerial Tramway, which provides a birds-eye view of the foliage as as you glide 4,200 feet up to the top of Cannon Mountain. The tourism site Travel New England has plenty of accomodation suggestions. Pennsylvania claims more than 2.5 million acres of state forest and state parklands that explode in color in the fall. It makes the state a popular destination for leaf viewing. "Fall is Pennsylvania's forte," said Carrie Fischer Lepore, a state tourism official. "We are home to a longer and more varied fall foliage season than any other state." Mid-October is prime time for leaf viewing in the upper Midwest, with miles of brilliant colors stretching from North Dakota to the hills of West Virginia. In Michigan, the Keweenaw Peninsula is a popular destination for fall foliage, where the leaves begin to turn in early October. For the adventurous who are not content to just view the scenery from the comfort of a car, there are bike tours and kayak trips. The Keweenaw Adventure Company has both of those areas covered, renting both bicycles and kayaks. It also provides lodging in cottages, cabins, chalets, and houses. The official Michigan tourism site, Travel Michgan, is making a major push to attract Autumn visitors. West Virginia is called the Mountain State for a reason. There are mountains everywhere and nearly all are covered by trees, which explode in color in mid-October. Winding two-lane roads will take you through some spectacular scenery, but a unique way to see the foliage is to board the New River Train Excursion, which starts at the former Chesapeake & Ohio mainline in Huntington and winds through the southern part of the state. There are four other train trips that travel past miles of colorful trees. Fall color comes to Colorado in stages, depending largely on elevation. The leaves start to turn in late September in parts of the Rockies and mid-October in the eastern plains. Trail Ridge Road makes its way though Rocky Mountain National Park, Estes Park, and Grand Lake. It's a great route for leaf peepers who want to get the first look at changing leaves. The San Juan Skyway extends in a 236-mile loop through the San Juan Mountains of southwest Colorado past mile after mile of blaze-colored leaves. You can park your car and board the Durango & Silverton Narrow Gauge Railroad, with trips timed to coincide with peak leaves along the route. But one of the favorites of Colorado's Autumn visitors is the Peak To Peak Scenic and Historic Byway, established in 1918. It starts in Boulder and takes travelers on a journey along the Continental Divide, where the fall colors are among the most dramatic in the state. No matter where you live, there are probably areas of spectacular fall foliage that don't require a long trip to get there. The secret, of course, is timing your arrival to a time when nature's show is at its height. To help plan your trip, check out this foliage map from the Weather Channel, which predicts when leaves will be at their peak all across the nation.